when we have data at two points but we need data in between them we use interpolation. Suppose we have the points (4,3) and (6,2) and we want to know the value of y at x=4.65, assuming y varies linearly between these points. we use the interp1 command to achieve this. % defined. That is why the value at x=9 is NaN. 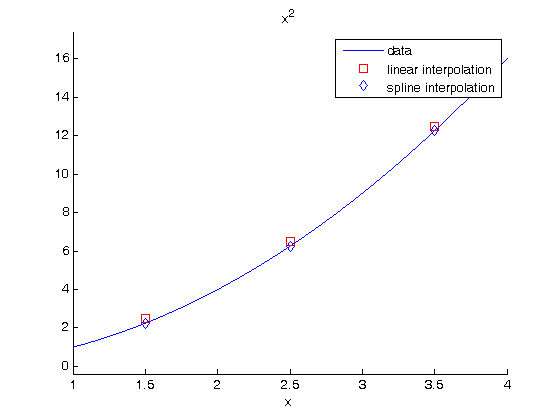 the default interpolation method is simple linear interpolation between points. Other methods exist too, such as fitting a spline to the data and using the spline representation to interpolate from. summary: in this case the spline interpolation is a little more accurate than the linear interpolation. That is because the underlying data was polynomial in nature, and a spline is like a polynomial. That may not always be the case, and you need some engineering judgement to know which method is best.